I LOVE it! Why, you may ask? 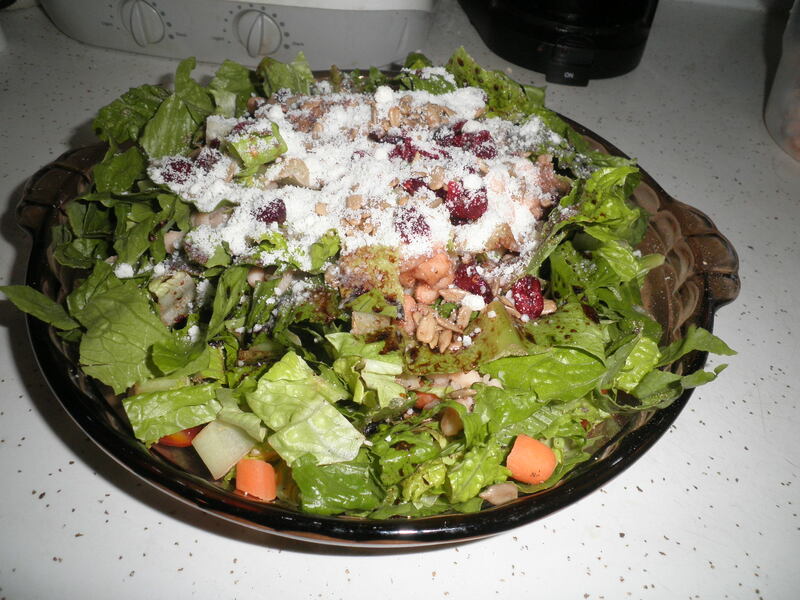 Leftover Salad! …a big plastic bowl of deliciousness! 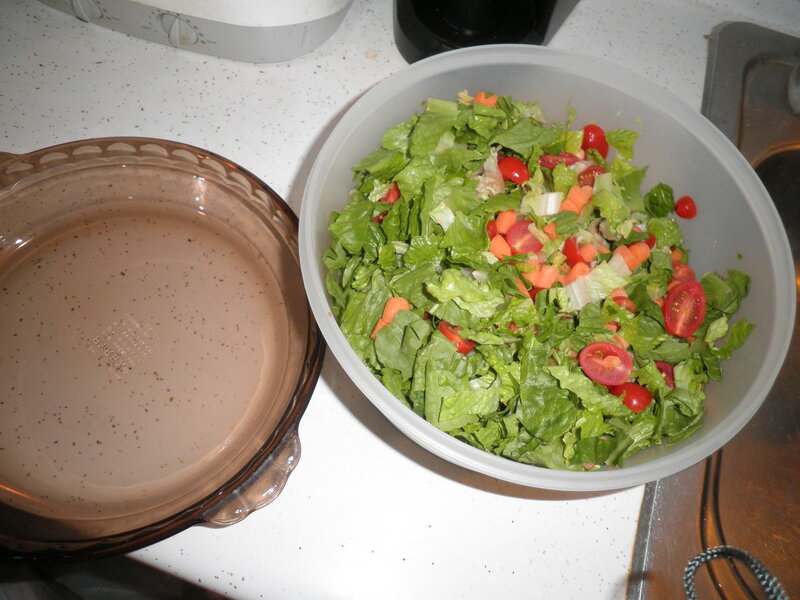 Some people say you shouldn’t cut lettuce in advance for salads because it gets all yucky. I used to do it all the time when I was still working. I had 5 containers that I would fill with the lettuce. 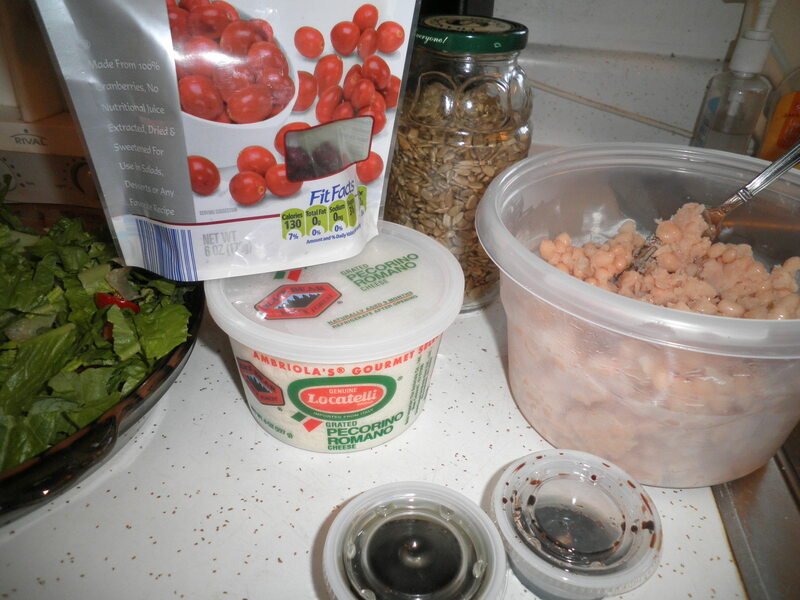 Then I’d have separate smaller containers I would put tomatoes or other combos of beans and veggies to put over the salads. They were done all at once on Sunday night and then I could be happy all week-long at lunch time. It gave me such a good feeling of having my food and my lunch under control when I did that. On a week when I didn’t get my lunches ready in advance, I was like a crazy person. I felt all at loose ends. I would then spend too much money for a salad that had too many of the things in it that I didn’t really need. Being in charge of my food makes me feel so much better. It was so good and really kept me satisfied for the evening. I realize that it looks like a lot of cheese, but I am so happy now that I calculated it and found that I can have 3 tablespoons of the cheese for only one point on Weight Watchers. That fact alone could keep me on Program and at goal forever! I got my car registered yesterday, gave her a tune up and today I get to take her for inspection. From what I’ve heard recently, they only check for emissions so it shouldn’t take very long. We’ll see about that! I’m happy in a way because I think this will probably be the last time I register my car in New Jersey. The next time will be in New Mexico! I can’t wait until the day I get to tell you all that I’ve accomplished that! I’m off to see what the day holds…Happy Wednesday! This entry was posted in Uncategorized and tagged beans, Weight Watchers. Bookmark the permalink.